Please visit this page again to be informed of the next fair or exhibition in which will participate the Stuc & Mosaic studio. 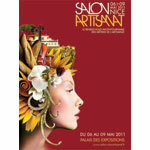 The Stuc & Mosaic studio was present on the Fair of the Artisanat de Nice (Alpes Maritimes). Exhibition on Art Deco style mosaics organised by the studio Stuc & Mosaic, at the Splendid Hotel & Spa, in Nice (February to October 2014) with guided tours on the noteworthy 1930’s mosaic in an Art Deco district in Nice.